There has been talk about increasing the frequency of the Watford and St Albans Abbey trains from their current frequency of every 43 to 60 minutes to every half an hour. Hertfordshire County Council did an investigation into the costs of installing the frequency to every 30 minutes however the proposal estimates the cost to be around £15-35m. However there is a way that we could get close to the same performance without any expenditure on a passing loop. It would be possible to increase the frequency of the trains from Watford to St Albans, and back again, to ever 30 minutes with no infrastructure investment if we make one assumption – that people are happy to get off the train and back on another train – bare with me…. Using the existing train timetable to use for the time between each station. The vast majority of these times are the same all day – the only exceptions being that sometimes trains wait for 5 or 6 minutes at St Albans Abbey before returning and the trains at Watford Junction wait between 6 and 23 minutes before leaving. To make the math simple I will assume that we wait 6 minutes at both St Albans and Watford Junction stations. The Hertfordshire County Council proposal was to put a passing loop at Bricket Wood which is 8 minutes from both Watford Junction and from St Albans Abbey. 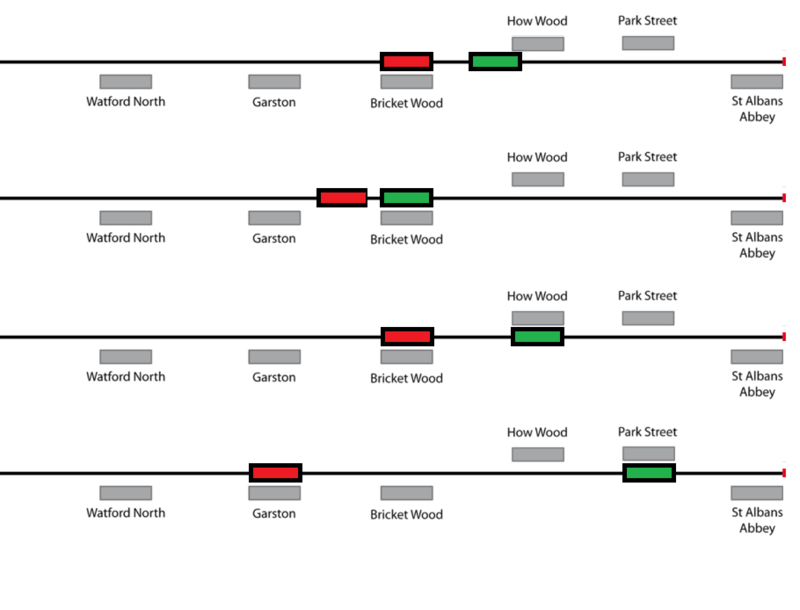 In this example instead of their being a passing loop one of the trains, we will call Train A, will arrive at Bricket Wood before the other train, Train B – Train A it will terminate at Bricket Wood station after everyone has disembarked. It will then pull out of the station before Train B arrives, Train B will also terminate at Bricket Wood but will immediately pick up passengers to take them in the reverse direction. Once Train B has departed Train A will return to collect the passengers looking to complete the remainder of the journey. The following diagram shows an example with Train A being shown in red and Train B being shown in green. It should be noted that Train A and Train B will alternate each time because of the train leaving from Bricket Wood earlier the previous time. To be able to turn around a train at Bricket Wood, get it out of the station so the other train can come in then turn the train around again to turn it around a third time there are two variables. Firstly how long it takes for the train crew to swap over and secondly how long it takes the train to move away from the platform. To keep things simple we will assume that we can move the train out of the station in 1 minute and back in in 1 minute as well. The second time, the time it takes the train to turn around (i.e. the train crew to swap ends of the train), this is unknown. We know that they can do this at St Albans in 5 minutes – but is this 5 minutes also used as a buffer in case the train is delayed? 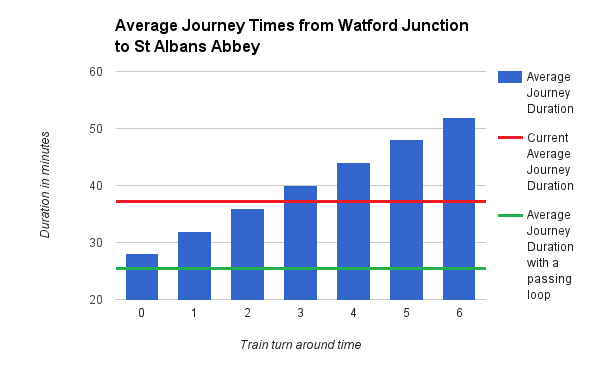 As such we will look at how the turn around time impacts the average journey duration from Watford Junction to St Albans Abbey where the journey duration is the average time to wait for a train (aka half of the waiting duration) plus the train journey duration. Here we can see if the train turn around time exceeds two minutes then the average journey duration is no better than it is currently of 37 minutes. If it were possible for the train driver to turn the train around instantly (perhaps because he can drive the train backwards) then the average journey time drops to 28 minutes – which is not far from the 26 minutes which would be achievable if there was a passing loop all without the required £15-35m just with an extra train and passengers happy to briefly get off the train at Bricket Wood – perhaps someone selling coffee on the platform would make them suitably happy for the minor inconvenience. To highlight, I don’t think this is an end solution to the problem but it might be a good next step so we can increase the frequency of the trains with no major costs and then at a later stage a passing loop could be installed to allow the trains to run directly through and thus removing the swapping over half way.